I already had been interested in electronics before I had my first computer – later I drifted off this topic a bit, but the tools (soldering iron, multimeter etc.) still exist and sometimes I also work on circuits as on LCD2USB am FLI4L. I’m also in Berlin from time to time and sometimes I also visit the shop of Conrad Elektronik – since something like this doesn’t exist in Augsburg and sometimes I’m also just a nerd ;-). At my last visit I found an interesting kit there – an interface card with serveral analog and digital in- and outputs which is controlled using USB and can be integrated in own applications quite easy. 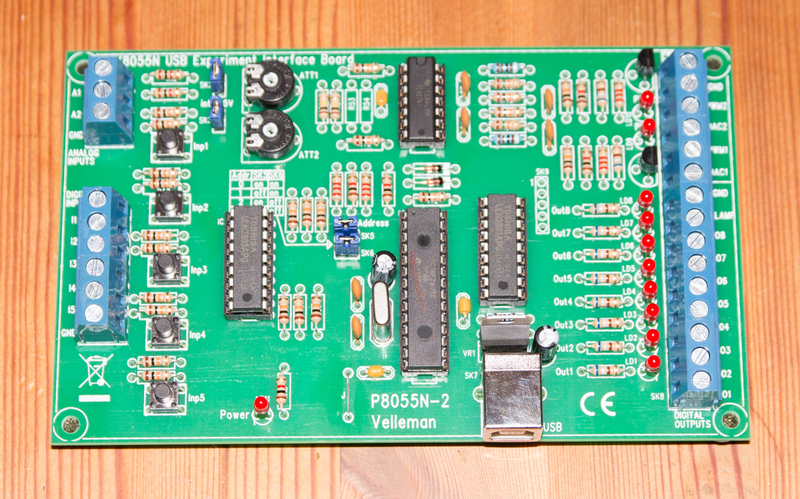 The Velleman K8055N is an interface card with USB connection which provides several analog and digital in- and outputs. Since the thing is distributed as a construction kit it is quite affordable for less then 30 EUR – on the other hand the assembly takes a while due to the number of components and the 313 soldering points. Due to the variable device address it is possible to use up to four of these cards simultaneously on one computer. The gain of the analog inputs can be increased with two optional resistors, if the input range of 0-5 volts is not sufficient. Optionally you can also mount a connection which can be used to program the PIC directly on the board if you have an appropriate programmer by Velleman. The card advertises itself to a computer under Windows as a “Humand Interface Device” (HID) and is therefore useable without any special driver. For first tests there is a demo program with which you can check all inputs and outputs. To make the integration in your own applications easier, Velleman also provides a comprehensive documentation and many samples in different programming languages. In my package the software was indeed not included but I had first to download it at http://www.vellemanprojects.eu/support/downloads/?code=K8055N&lang=en, where you also find the documentation. For Linux you will find a library at http://libk8055.sourceforge.net. On http://jannicash.info/k8055/ you find an open source version of the firmware.